Like humans, the medical health of a dog or cat directly depends on his or her dental health. Left unmanaged, poor dental hygiene can lead to severe symptoms and conditions. A discoloration of the teeth would be the next symptom you notice. Healthy canine or feline teeth are white, just like humans. The darker the discoloration, or the closer it is to the gum line, the more serious an issue you have on your hands. Once periodontal disease sets in, the gum will become red and swollen. Left untreated, your pet's gums will begin to bleed. The final symptom of gum disease will be a loosening of the teeth. This most likely means your pet has already experienced bone loss and is well on his or her way to losing teeth for good. A sudden change in appetite is a potential sign a pet's teeth may be starting to loosen. Dental radiology is an extremely important tool in veterinary dentistry. Did you know that 27% of diseased teeth appear normal above the gumline? Using dental X-rays allows the veterinarian to identify painful, diseased teeth that require treatment. Without dental X-ray, many of these teeth would not be identified, allowing the dental disease to worsen. Whether you have a puppy or kitten, a senior pet, or a four-legged friend of any age, his or her dental health starts with regularly scheduled professional cleanings. This is why every exam at DHAH, no matter the issue, includes an exam of your pet's teeth. If a cleaning is in order, you'll be the first to know. 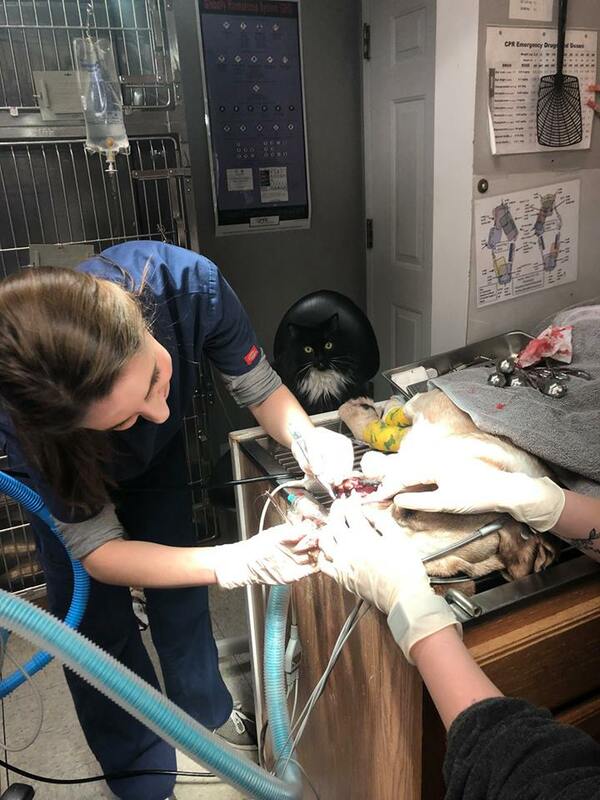 In between your pet's scheduled cleanings, there are a couple things you can do to cut down on plaque and tartar buildup. For those with a more cooperative pet, regularly brushing his or her teeth is definitely recommended. For less cooperative animals, or as another means of maintaining healthy teeth, we recommend OraVet Chews. These soften and remove dental plaque and calculus, while also creating a barrier against attachment of bacteria to teeth, tongue, and gums. The natural chewing mechanism softens and removes existing plaque and calculus, while releasing a protective agent to prevent future plaque buildup.. OraVet Chews are always available for purchase at our front desk.